Natalia is a multi-media artist born in Alma Ata in the SouthEastern region of the Soviet Union. Natalia spent her early years surrounded by the natural beauty of the foothills of the Himalayas in Kazakhstan. The family spent every weekend at the Datchau, a weekend getaway, in the serene wilderness near the Mongolian border. She later expressed the indelible impressions of this experience through a number of watercolors; the media she first mastered designing woman's fashion. Before the Perestroika of 1985, Natalia was able to complete a B.A. in fashion design at a prestigeous St.Petersburg University Fashion School and embarked on a promising career as Fashion Designer and Model. Within a short time she became a leader in her profession; her team of cutters and seamstresses travelling the Soviet Union showing her collections across the country. Before the collapse of the Soviet Empire she has experimented in theatre and movies. Her final role was as Gorbachova travelling in the Soviet Union with a troupe of actors showing a comedy featuring the past leaders of the nation; Lenin, Stalin, Czar Nicholas naming only a few. All her spare time spent sketching, drawing the memorable scenes and characters of her vast country. After the breakup of the Republics she earned a living teaching art and fashion design until the opportunity has arrived to find a new home away from Russia. Two years in the Middle East forced her to switch and learn to use acrylic and pastel to overcome the disadvantage of the fast drying oils and turpentine in the excessive heat. 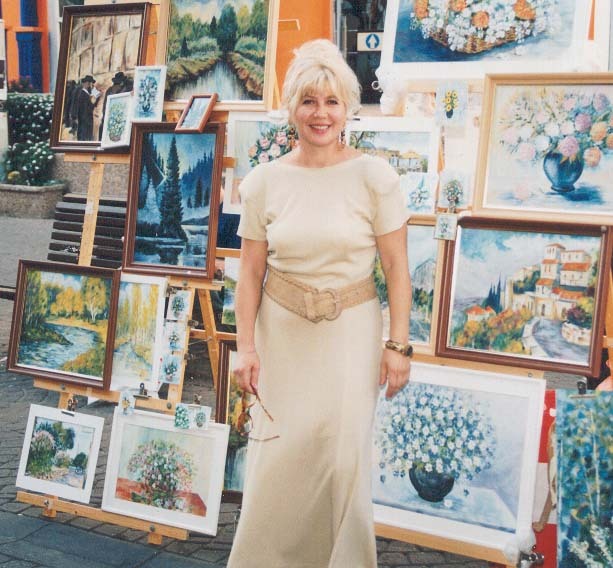 These were her most productive years producing and selling hundreds of paintings, signed Natalia Lubanskya, mainly to tourists from around the World. Natalia Iouchkina Lubanskya Simen-Falvy, a somewhat self-taught artist, creates brilliantly-coloured, memorable pieces with lively shapes and rich designs. She has been exhibiting in Canadian and American art and craft shows and exhibits since she emigrated from the Soviet Union. In 2001 she began experimenting with pastel and media found in nature. Natali forges delicate stripes, gridlines and textures by layering her media of different colours in a style unique only to her. She is considered to be virtually without peer in her technical perfection of mixing media within the same frame. Mixing Batik and hot wax was seldom considered art until Natali who is more of a painter then a textile artist, began to combine the two in her miniatures. The details in many of this versatile artist's miniatures are created with thousands of tiny strokes. She captures textures from thatch to feathers in a display of artworks that include wildlife and wilderness. She is best known for her pictures of animals and flowers. Natalia has been creating batik artworks since she finished art school in 1983. Portraits are composed in traditional pictorial ways, rather than applied as patterns or motifs as might be expected of batik art. Working within the confines of rectangular and square formats that are meant to be hung on walls, Natalia creates strong lighting effects that lend an additional naturalistic perspective in three dimension. Now in her late 40s, Multi Media Artist Natalia Simen-Falvy continues to draw and paint brilliantly. In the Spring of 2001, she received an invitation to join a group of seasoned artists in a Fort Langley gallery workshop. In the Fall of 2001, her excellence in the field of visual art brought her to exhibit at a prestigious Seattle gallery. Currently she is showing at with the Friends of the Mission Library and the Place des Arts in Coquitlam, BC. Canada. You can find her most current work on the walls of the offices of the Surrey Board of Trade. While embarking on a new series of still life paintings last year, Natalia suddenly found herself focusing on the objects themselves, to the exclusion of foreground or background. This exhibit traces her creative journey as she explored the necessity of backgrounds colors. As the work progressed, vases of flowers, bowls of fruit, birds and clusters of shrubs began shifting towards the edges of their frames, in some cases leaving behind painterly expanses of neither-ground-nor-object. Her most recent paintings have an all-over patterning of repeated objects - leaves, flowers, animal like shapes-, which are almost suspended in a whimsical sense of vertical space. By making duplications of her oil paintings in pastels, and by copying some of her pastel drawings as oil paintings or watercolors, Natalia adds another engaging note to her work.. Images selected from her lifetime collection of drawings allow her to revisit sites of her personal history and her homeland. It is almost as if she has caught two Russia's: The Russia of the Czars and the New Russia of the Bolshevik Revolution. Yet never are the two fully integrated. A parallel universe of opulence and splendor and the stark reality of Communist Russia infiltrates through scenes of architecture new and old, side by side.The juxtaposition is often incongruous and unsettling, both real and surreal, much like Natalia's two lives must be; there is something very grand and amazing about it but it's also very dark and tragic. Her large oils carry these ominous feelings.